A baronet (/ˈbærənɪt/ or /ˈbærəˌnɛt/; abbreviated Bart or Bt) or the rare female equivalent, a baronetess (/ˈbærənɪtɪs/, /ˈbærənɪtɛs/, or /ˌbærəˈnɛtɛs/; abbreviation Btss), is the holder of a baronetcy, a hereditary title awarded by the British Crown. The practice of awarding baronetcies was originally introduced in England in the 14th century and was used by James I of England in 1611 as a means of raising funds. A baronetcy is the only British hereditary honour that is not a peerage, with the exception of the Anglo-Irish Black Knight, White Knight and Green Knight (of which only the Green Knight is extant). 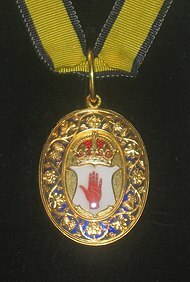 A baronet is addressed as "Sir" (just as is a knight) or "Dame" in the case of a baronetess but ranks above all knighthoods and damehoods in the order of precedence, except for the Order of the Garter, the Order of the Thistle, and the dormant Order of St Patrick. Baronets are conventionally seen to belong to the lesser nobility even though William Thoms claims that "The precise quality of this dignity is not yet fully determined, some holding it to be the head of the nobiles minores, while others, again, rank Baronets as the lowest of the nobiles majores, because their honour, like that of the higher nobility, is both hereditary and created by patent." Comparisons with continental titles and ranks are tenuous due to the British system of primogeniture and the fact that claims to baronetcies must be proven; currently the Official Roll of the Baronetage is overseen by the Ministry of Justice. In practice this means that the UK Peerage and Baronetage consists of about 2000 families (some Peers are also Baronets), which is roughly 0.01% of UK families. In some continental countries the nobility consisted of about 5% of the population, and in most countries titles are no longer recognised or regulated by the state. The term baronet has medieval origins. Sir Thomas de La More (1322), describing the Battle of Boroughbridge, mentioned that baronets took part, along with barons and knights. Edward III is known to have created eight baronets in 1328. Present-day Baronets date from 1611 when James I granted Letters Patent to 200 gentlemen of good birth with an income of at least £1,000 a year; in return for the honour, each was required to pay for the upkeep of thirty soldiers for three years amounting to £1,095, in those days a very large sum. In 1619 James I established the Baronetage of Ireland; Charles I in 1625 created the Baronetages of Scotland and Nova Scotia. The new baronets were each required to pay 2,000 marks or to support six colonial settlers for two years. Over a hundred of these baronetcies, now familiarly known as Scottish baronetcies, survive to this day. As a result of the Union of England and Scotland in 1707, all future creations were styled baronets of Great Britain. Following the Union of Great Britain and Ireland in 1801, new creations were styled as baronets of the United Kingdom. Unlike knighthoods – which apply to the recipient only – a baronetcy is hereditarily entailed. The eldest son of a baronet who is born in wedlock succeeds to a baronetcy upon his father's death, but will not be officially recognised until his name is recognised by being placed on the Official Roll. With some exceptions granted with special remainder by letters patent, baronetcies descend through the male line. A baronetcy is not a peerage, so baronets like knights and junior members of peerage families are commoners and not peers of the realm (N.B., in the UK, all people save the Sovereign and peers are considered commoners). According to the Home Office there is a tangible benefit to the honour of baronet: according to law, a baronet is entitled to have "a pall supported by two men, a principal mourner and four others" assisting at his funeral. Originally baronets also had other rights, including the right to have the eldest son knighted on his 21st birthday. However, at the beginning of George IV's reign, these rights were eroded by Orders-in-Council on the grounds that Sovereigns should not necessarily be bound by acts made by their predecessors. Baronets although never having been automatically entitled to heraldic supporters, were allowed them in heredity in the first half of the 19th century where the title holder was also a Knight Grand Cross of a Crown order. The wife of a baronet is addressed and referred to as "Lady <Bloggs>"; at the head of a letter as "Dear Lady <Bloggs>". Her given name is used only when necessary to distinguish between two holders of the same title. For example, if a baronet has died and the title has passed to his son, the widow (the new baronet's mother) will remain "Lady <Bloggs>" if he (the son) is unmarried or never marries, but if he is married or becomes married then his wife becomes "Lady <Bloggs>" while his mother will be known by the style "<Alice>, Lady <Bloggs>". Alternatively, the mother may prefer to be known as "The Dowager Lady <Bloggs>". A previous wife will also become "<Alice>, Lady Bloggs" to distinguish her from the current wife of the incumbent baronet. She would not be "Lady <Alice> <Bloggs>", a style reserved for the daughters of Dukes, Marquesses and Earls. As of 2016[update], there are no living baronetesses. Baronets of Nova Scotia, unlike other baronets, do not use the Baronet's Badge (of Ulster), but have their own badge showing the escutcheon of the arms of Nova Scotia: Argent, a Saltire Azure with an inescutcheon of the Royal Arms of Scotland. From before 1929 to the present it has been customary practice for such baronets to display this badge on its own suspended by the order's ribbon below the shield of arms. As of 2000, including baronetcies where succession was dormant or unproven, there was a total of 1,314 baronetcies divided into five classes of creation included on The Official Roll of the Baronetage – 146 of England, 63 of Ireland, 119 of Scotland, 133 of Great Britain and 853 of the United Kingdom. The total number of baronetcies today is approximately 1,204, although only some 1,020 are on The Official Roll of the Baronetage. It is unknown whether some baronetcies remain extant and it may be that nobody can prove himself to be the actual heir. Over 200 baronetcies are now held by peers and others, such as the Knox line, have been made tenuous due to internal family dispute. There were 1,490 baronetcies extant on 1 January 1965. Since then the number of baronetcies has been reduced by 286 through extinction or dormancy resulting in a gross decline of 19.2% or almost one-fifth over 52 years (as of 2017). Extant baronetcies numbered about 1,236 in 2015, and 1204 as of 2017. ^ a b "Baronet". Collins Dictionary. n.d. Retrieved 23 September 2014. ^ "Baronetess". Dictionary.com Unabridged. n.d. Retrieved 15 August 2016. ^ "Baronetess". Collins Dictionary. n.d. Retrieved 23 September 2014. ^ Kershaw, Stephen. "BARONETS OF ENGLAND, SCOTLAND, IRELAND, GREAT BRITAIN AND THE UNITED KINGDOM" (PDF). The Standing Council of the Baronetage. Retrieved 21 September 2017. ^ a b "Baronetage decline since 1965". Retrieved 21 September 2015. ^ "Baronial family von Friesendorff" (in Swedish). The House of Knights. Archived from the original on 3 December 2013. Retrieved 30 November 2013.